On December 4, 1760, the town of Durham announced the completion of their hospital house. An outbreak of disease the year prior had prompted its construction. In November of 1759, John Jones, a Durham resident, contracted smallpox a disease for which was there was no known cure. At the time, isolation from other community members was seen as the only recourse to prevent the rapid spread of the contagion and the entire Jones family was removed to an old barn on the southern edge of town. Before the discovery of the smallpox vaccination in 1798, entire communities could be quickly decimated. The disease spread by physical contact with the infected’s open sores or contaminated clothing and bedding. The disease’s wheezing cough made airborne transmission possible, too. So, infected persons were seen as an immediate threat to the community. Jones, his wife and daughter all died and were buried a month after being infected, and their house on the Town Green was torn down the following spring. On April 14, 1760, the town voted to build a hospital to provide a place of quarantine against future outbreaks. Located northwest of Pisgah Mountain near Cream Pot Road, a simple clapboard structure was constructed measuring 20-feet wide and 30-feet long with a fireplace and well. The Pest House served the town until the 1790s, and records indicate that during its operation 31 people with the disease were buried in the area, away from official town cemeteries. 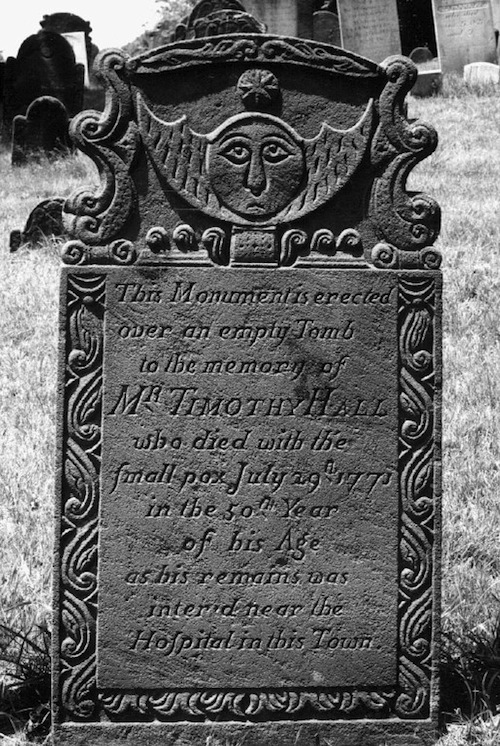 Currently, only one gravestone remains to mark the history of smallpox in Durham: that of Timothy Hall who died in July 29, 1775.